Immersed in a world of majestic mountain peaks, turquoise waters and white-sand beaches, visitors to our islands create memories through authentic experiences that cannot be found anywhere else in the world. For centuries, the Tahitian people have referred to this as "Mana". Mana is a life force and spirit that surrounds and connects all living things. You can see it. Touch it. Taste it. Feel it. And from the moment you arrive, you will understand why we say our islands are Embraced by Mana. Tahiti – Tahiti or the Islands of Tahiti, which is officially known as French Polynesia, consists of five island groups, or archipelagoes, which lie in the South Pacific – south of the equator, in the same time zone as Hawaii. Time Difference: Tahiti is in the same time zone as Hawaii, two hours behind Pacific Standard Time, and three hours behind during daylight saving time (late April through October). Size: Tahiti extends over such a large area that it took explorers several years to discover and chart all 118 islands and atolls. The total area covers more than four million square kilometers (1.5 million square miles). Total land area of the 118 islands and atolls covers only 4,000 sq. km., or 1,544 sq. mi. The Islands: The most frequently visited islands are Tahiti, Bora Bora, Moorea, Huahine, Raiatea, Taha'a, and Rangiroa. More and more travelers are discovering the destination's incredible and distinctive beauty that is found throughout the archipelagoes. Topography: Tahiti's varied landscape ranges from just-above sea level coral atolls to volcanic mountain peaks. Tahiti is renowned for warm waters, white-sand beaches, stunning turquoise lagoons, lush green hills and abundant flowering plants. Capital of Tahiti: Tahiti's capital city is Papeete, located on the island of Tahiti. 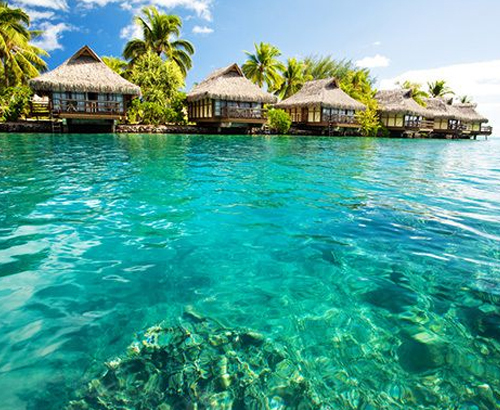 Population: The number of people living in Tahiti is just over 245,000. About 75% are Polynesian; 15% European and about 10% Chinese. Temperatures and Seasons: Tahiti is a 12-month tourist destination, with predictably tropical weather year-round. The average year-around temperature is 79 degrees Fahrenheit. Many hotels are air-conditioned. Water temperatures average 79 degrees in the winter and 84 degrees during the summer, with less than a degree of variation from the surface down to a depth of 150 feet. Languages: French and Tahitian are the official languages, though English is widely spoken is tourist areas. Currency: Tahiti's currency, the French Pacific Franc (XPF, previously CFP), fluctuates with the euro (there are about 100 XPFs for every U.S. dollar). Hotels and financial institutions offer exchange services. Euros and major credit cards are widely accepted. Tipping: Tipping is not customary or expected in Tahitian culture. However, tipping is always welcome for exemplary service. Popular Activities: Some of the world's best snorkeling, scuba diving and surfing are found in Tahiti. Also popular – outrigger canoeing, bicycle and horseback riding, four-wheel jeep safaris, spear and deep sea fishing, swimming, sailing, jet skiing, wind surfing, tennis, island tours, shark and ray feeding, helicopter rides, museums, ancient maraes (temples), and other cultural experiences. Sunset watching, beach strolling, relaxing in the sand, enjoying exquisite Tahitian cuisine, walking through beautiful fragrant gardens, and simply getting to know the friendly and hospitable Tahitian people are memorable highlights of any visit to Tahiti. Getting Around: Taxis and buses are popular forms of transportation on the main island of Tahiti. On the outer islands, car and scooter rentals are available and "Le Truck" (open-air buses) are an inexpensive means of getting around. Boats are often the mode of transportation on many of the islands including Bora Bora. Cruise Ship: Tahiti offers a wide range of cruising options, including Princess Cruises, Paul Gauguin Cruises, and the Aranui. Shopping: Shops are generally open from 7:30 a.m. until 5:30 p.m., except on Saturdays when many close at noon; only hotel shops are open on Sunday. Long lunch breaks are common in Tahiti. Duty- free shopping is mainly available on Tahiti. Tahitian cultured pearls, mother-of- pearl shell carvings, coconut and tiare soaps, monoi oil, vanilla beans, shell leis, wood carvings, colorful pareus, and woven hats and baskets are among the most popular items. Entertainment: Music and dancing tell the story of the Tahitian people. Beautifully costumed dancers demonstrate beauty, strength and grace in traditional dances, which have been passed down for generations. Tips for Travelers: The electric current in most hotels is 110 or 220 volts, depending upon the specific location. Visitors should bring adapters, sunscreen, sunglasses, insect repellant and a hat for shade. Loose fitting cotton washables are recommended for comfort, and old sneakers or rubber aqua socks are suggested for walking in shallow water. The Activities Desk at hotels in the islands of Tahiti are an excellent source of information. You'll find knowledgeable staff who are eager to assist you! Arrive at Papeete airport. Welcome and transfer to your hotel. Overnight at hotel. After Breakfast Day free for your own leisure or you can explore the Papeete on your own Exploring Papeete : Head into downtown Papeete in time for a long French lunch; then take a walking tour of this busy but fascinating city, the bustle of the famous covered market and the new waterfront, recently remodeled. Head back to your hotel for some relaxation before watching the sunset over Moorea. Overnight at hotel. Breakfast at hotel. Day free for your leisure Or Roam around to Tahiti on your own Circling Tahiti : You can either rent a vehicle or take a guided tour around Tahiti's coastal road. Either way, stop at James Norman's Home, the Gauguin Museum, and the Museum of Tahiti and Her Islands, all of which will inform you about Tahiti's interesting history. If you drive yourself, take along a swimsuit and beach towel for a visit to Maui Beach, Tahiti's top sands. At night, watch one of the dance shows at the hotels. Overnight at hotel. Breakfast at hotel. Day free for your leisure OR take optional Safari Expedition tour Taking a Safari Expedition into Tahiti's Interior : You may think you've seen all of Tahiti after your round-island tour, but not so. A safari expedition by four-wheel- drive vehicle will take you into the mountainous interior, which is a very different world from the coastal road. If the weather permits, these trips follow the Papenoo Valley into Tahiti's extinct volcanic crater. Have dinner at les roulottes, the carnival-like meal wagons on the Papeete waterfront. Overnight at hotel. Surfing : The incredible surf spot of Teahupoo with its giant wave called " the Jaw " in the surfing world. A must for any self-respecting surfer. Overnight at hotel.